What Approvals Do I Need For My Modular Home? All new buildings are required to meet relevant council approvals and comply with applicable legislation's. In most cases, there are 2 types of approvals you need to consider; planning and building approval. If your home falls into any of these categories, then it is likely you will require planning approval prior to building. With a quick check on the Department of Planning’s website or a call to your local shire, we will be able to identify any need for planning right from the get go! It is true that if planning approval is required for your home, it will incur an additional cost. The good thing is that we can predetermine this figure by calculating the estimated cost of your home and which scheme it falls into. For example, if your home costs between $50,000 and $500,000 then planning approval will be a maximum .32% of the total development. Once a planning application is submitted, the council have 60 business days to determine approval. This may seem like a long time, hence why Evoke Living Homes make sure the planning process is one of our first steps when progressing with a job. This allows us for the organisation of all all other approvals whilst waiting for planning approval to be granted. Now that you know about planning, what about building permits? In Australia, a building permit is required before carrying out any* works when constructing a home. The building permit is to ensure your home is constructed in a way that is safe and compliant with all legislation's relating to your specific land and home. As standard, Evoke Living Homes submits all building permits as certified – meaning the shire is limited to 10 business days to decide on the application, opposed to 25 business days with an uncertified permit. 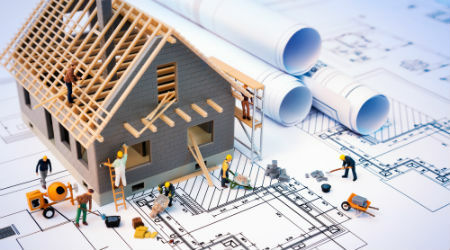 All this means is that we engage an independent assessor to review your plans and specifications, planning approvals, BAL and energy certificates, structural engineered plans and pest management systems, before we are supplied with a Certificate of Design Compliance (BA3) to submit to the local council. Evoke Living Homes includes all associated fees with building permits in your contract to avoid any unexpected surprises. In addition to covering the cost of a building permit, we will take care of the communication with the shire, ensuring this is a seamless and stress free process from start to finish. If you have any questions on the approval process for your home contact our team for professional and simplified advice.